Attention. If a store is not registered as a legal entity in Russia, it can't sign up for the program or the prepayment option independently. To sign up for the program, contact a Yandex.Market manager. Your store will be connected to the program using the API and be able to accept prepayments right away. If you sign up for prepayment, users will be able to pay for your products immediately when placing an order on Yandex.Market. The available prepayment methods include bank card and Yandex.Money. These payment methods are displayed next to your store offers and on the order page. Why sign up for prepayment? You can promptly receive payments in your store account — even before the buyer receives the order (usually on the next business day after the order has been dispatched for delivery). It is less likely that the buyer will cancel the order or not pick up the product. If the order is canceled before it is dispatched for delivery, Yandex.Market will issue a refund to the customer. The funds that were reserved in the buyer's account are released. When a customer returns a product after they have received their order, the store can easily issue a refund through its personal account. You can activate prepayments for any order processing method from Yandex.Market (CMS, API or personal account). Before signing up, you can test orders involving prepayment by using the API or in your personal account depending on the order processing method that you select. Fill out the form. Only an Administrator or Main Contact for your store can fill out the form. Prepayments will be credited to the account that you specified on the application. 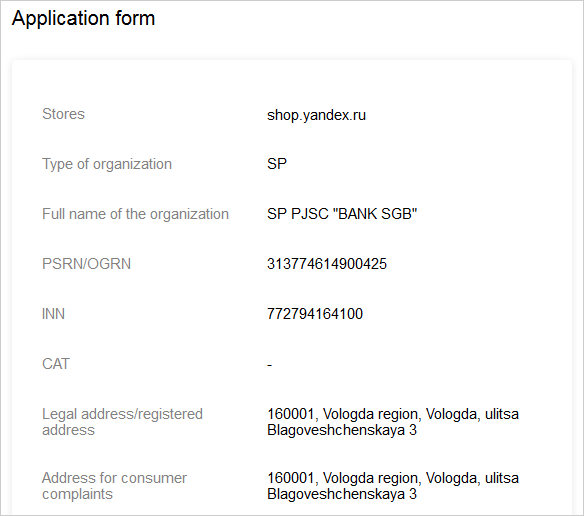 If the legal information specified on the application differs from what was specified at the time of store registration, it will be completely updated in the Yandex.Market database after prepayment registration is complete. You will be able to view the updated information in the Legal information section on the General settings page. Attention. After you sign up for prepayments, you will not be able to change your legal information yourself. If several stores belong to one legal entity or sole proprietor, then you can list all of your stores in a single application by selecting them in the Stores drop-down menu. If the stores belong to multiple legal entities or individual sole proprietors, then the application for each store must be submitted separately. Notices about the prepayment registration status will be sent to the email address that was entered in the Email of the contact person field. Attention. In the future, any requests to disable prepayment or change legal information will only be accepted from this address. If you are acting on the basis of a power of attorney, attach a scan of this document to your application. You can save the application and return to it later if you don't remember some of the information, such as the Principle State Registration Number (OGRN) or Bank Identification Code (BIC). When your application is completely ready, click the Continue button. Choose the taxation system and VAT rate that are suitable for most of your products. According to the general taxation system, the VAT for individual products may differ. In this case, enable the Further take rate of the VAT from the price list option and specify the rates in the vat element. Note. Keep in mind that other systems do not apply VAT to any products. The rates should be the same for all products in these systems. Select the VAT rate for product delivery. Download and print out the application. It will be automatically formatted. Sign it and attach a scan of it to your application. Your application will be processed within two business days. If you are acting on the basis of a power of attorney, attach it to the application. After you submit your application, you will receive a test order involving a prepayment. You can fulfill it by using the API or in your personal account, depending on the order processing method that you select. You will not be able to register to accept prepayment if your store is not able to process the test order involving a prepayment. This will not change your store's placement on Yandex.Market. Your store will continue to receive orders with postpayments. You will receive a message about any errors and information about the further steps that you need to take in the Pre-payment when taking orders section. Notifications and information about the registration results will be sent to the email address of the main contact and the person indicated in the application. If the outcome is positive, then customers will be able to start paying for your products on Yandex.Market using prepayments within 24 hours. Submit the original application and a copy of your power of attorney (if you are acting on the basis of one) to the following address within 30 days of registration: Yandex.Market, d. 16, ul. Lva Tolstogo, Moscow, Russia, 119021. For prepaid orders, the store pays an agency fee of 2% of the total cost of the order (cost of the items + delivery) and does not pay the minimum commission fee for the order. If the store has increased the commission fee for the order, it only pays the difference between its commission fee amount and the minimum fee. You can find detailed information about the fee in the sections Crediting Prepayments to the Store and Fee Paid by the Store. How much time will it take to sign up? Application processing does not take more than two business days. If additional information or documents are requested, then an additional two business days will be required to process them. Can I disable prepayments or sign up for them again? Yes, you need only select the Disabled/Enabled option on the General settings page. What should I do if my payment or legal information changes? Attention. After you sign up for prepayments, you will no longer be able to independently edit the data in the Legal information section on the General settings page. In order to update your information, you will need to send a request to the address market-payment@support.yandex.ru from the email address that was provided on the prepayment registration application. What should I do if the taxation system or the basic VAT rate change? You can change this information at any time on the Connections and setup → General settings page in the Pre-payment when taking orders section. Our store already offers a prepayment option. Why should I sign up for prepayments through Yandex.Market? The buyer will only be able to select a prepayment option in your store if they decide to place an order on your store's site. If a customer places their order directly on Yandex.Market, they will not be able to use your prepayment option. Therefore, we recommend that you activate the prepayment option in addition to signing up for the “Quick Order” program.